The Kitchen is making all things wrapped and rolled, starting with Geoffrey Zakarian's Prosciutto-Wrapped Chicken Breast. The Kitchen Helpline is open to answer your questions on how to wrap foods in bacon, a burrito and spring rolls, then learn how to master the art of gift wrapping. 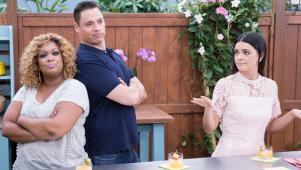 Jeff Mauro shows how to make his Horizontal Chicken Shawarma Wrap, cookbook author Nikki Dinki stops by to make Zucchini Taco Wraps, and Geoffrey whips up an "Engaged But Cantaloupe" cocktail. Plus, The Kitchen's very own rap sensation "Herb and Spice" is back with their best song yet! 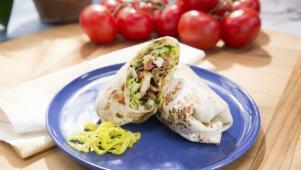 Jeff rolls all the best flavors of chicken shawarma up in a wrap. 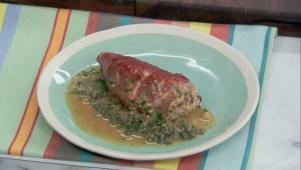 Geoffrey prepares a simple pan sauce for his stuffed chicken breasts. 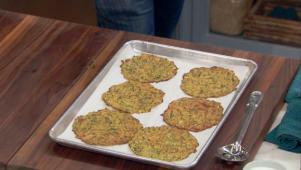 Nikki Dinki stops by to make two unexpected recipes featuring zucchini. Herb and Spice liven things up with a rap song recapping the show.